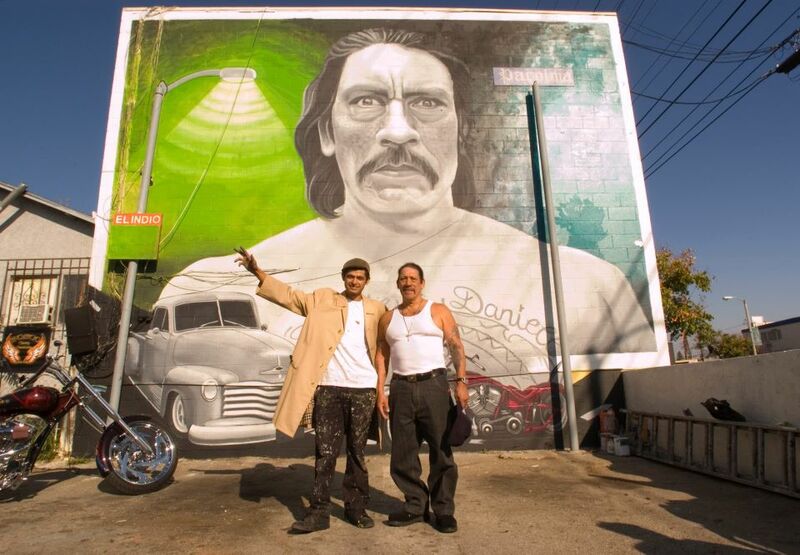 Ponce’s personal and commercial artwork can also be found in Venice Beach, throughout the U.S., and in Mexico and Turkey. 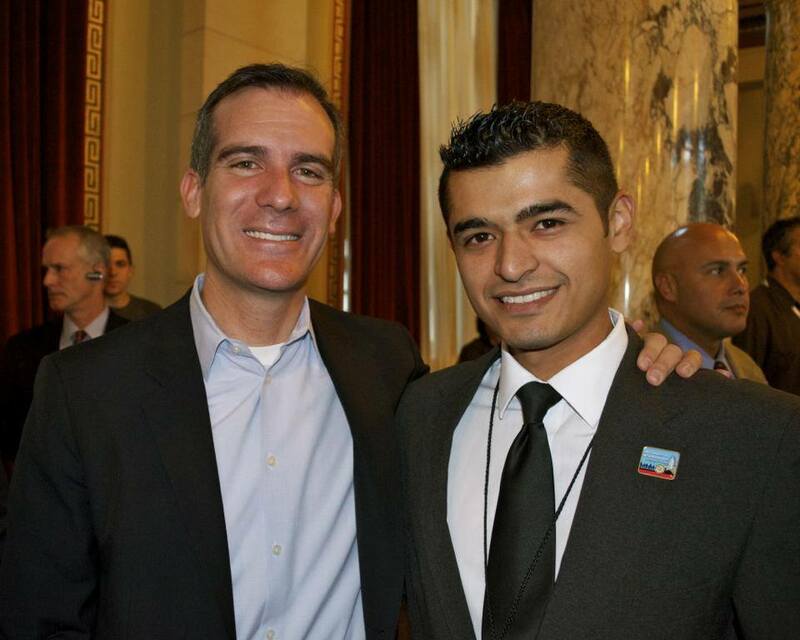 He has been recognized for his efforts with awards from Los Angeles City Council and members of the California State Assembly and Congress. 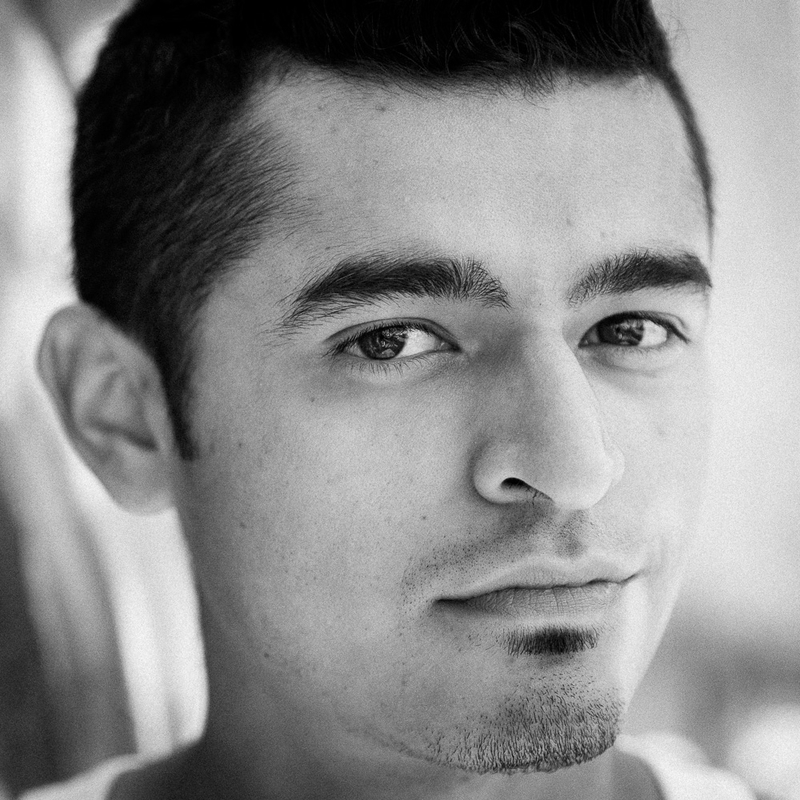 Also an animator and digital compositor, Ponce has worked on such films as Star Wars: The Force Awakens and Interstellar. He currently works at Walt Disney Imagineering. Anita Malhotra spoke with Ponce, who was at his Los Angeles home, by phone on March 11, 2017. AM: What was your first exposure to art as a child? LP: I’ve always been around art. My dad’s a sign painter, so ever since I was a child I went all over town, up and down Los Angeles, painting signs with him. 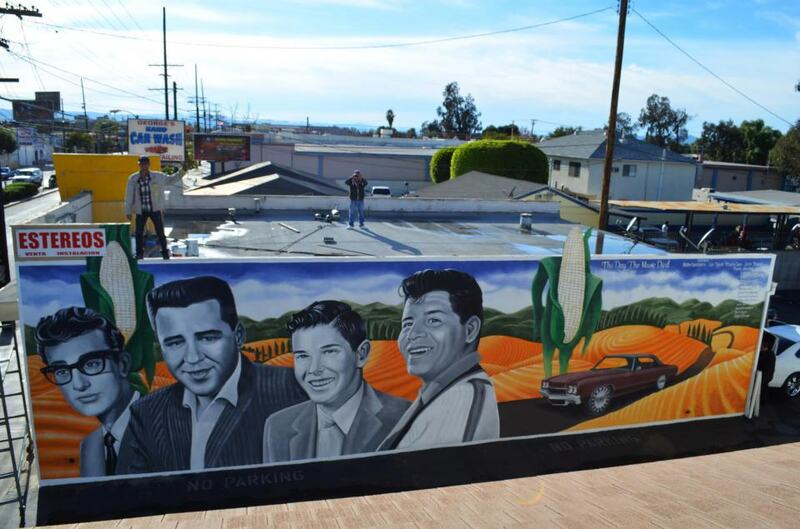 Painting signs exposed me not only to my father’s art of sign painting and murals and graphics but also to the art around the city and the art on the walls – be it graffiti or other muralists like Kent Twitchell. AM: Can you tell me a bit about your family and growing up in Pacoima? LP: My dad’s an illegal immigrant from El Salvador. He’s a U.S. citizen now. My mom’s an illegal immigrant from Guatemala. She’s a U.S. citizen now. And they met here in the States in the early ‘80s. I came around in 1987, and they’ve been together since. We grew up in Pacoima – my mom was a seamstress. She worked at a sweatshop, now she cuts hair. My dad’s a sign painter to this day. And I have a brother, I have a sister, I’m the oldest of three. 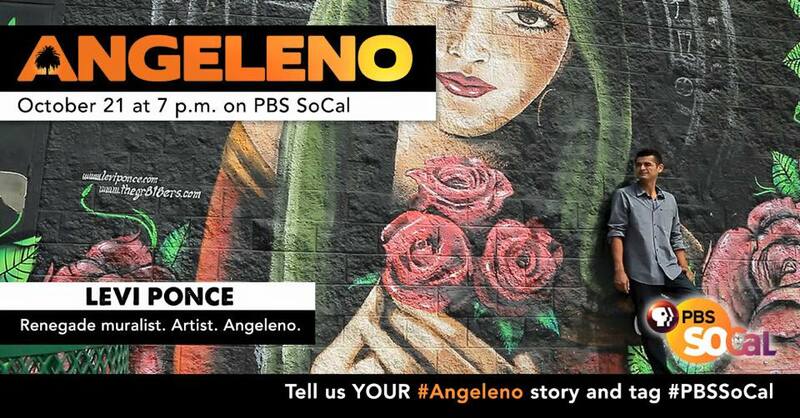 AM: What inspired you to start painting murals in Pacoima? LP: Working with my father, when we would paint we would go all over L.A. and I would see that Los Angeles had art everywhere. Downtown L.A. has art, Hollywood, the Westside, everywhere you went you saw art. 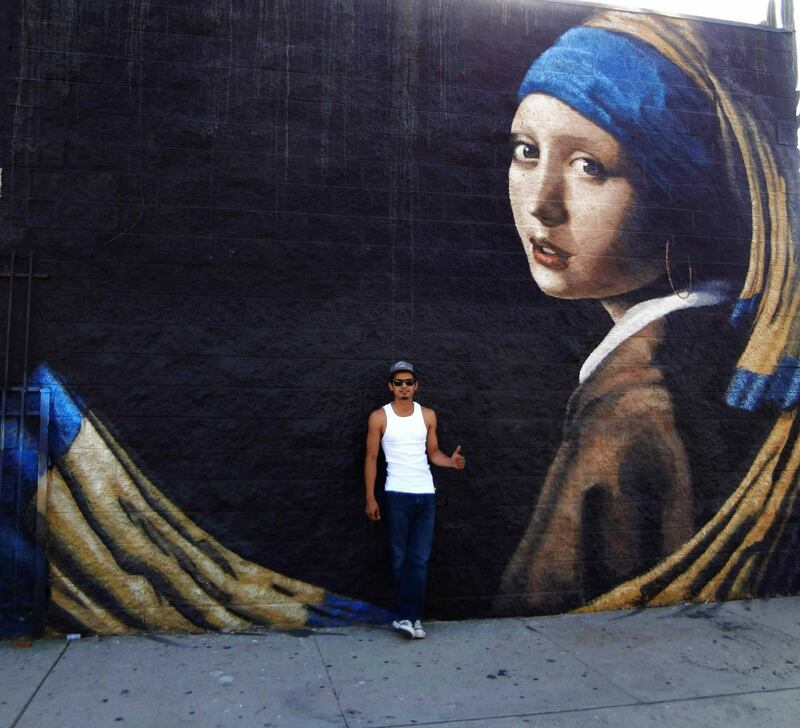 Whether it was highbrow, lowbrow, there was art on the streets. And when we came home up here to the San Fernando Valley, which is literally removed from Los Angeles, there wasn’t really any art on the walls. 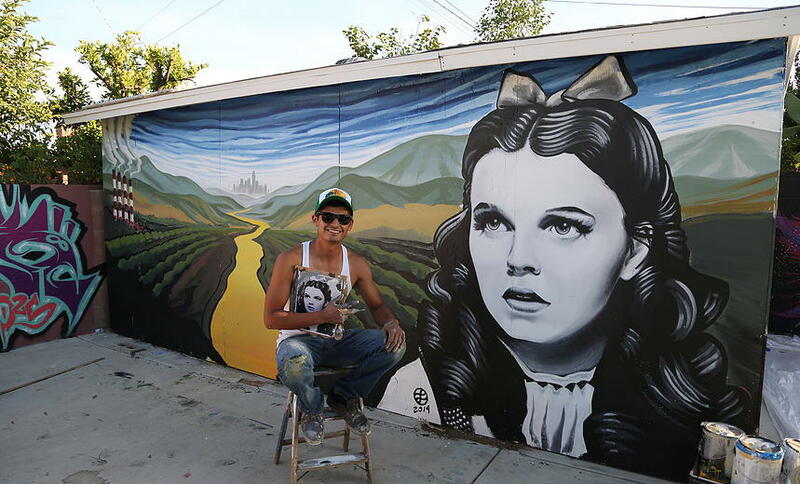 There was graffiti, there were some school murals, but it wasn’t what you saw in Los Angeles. So when I started painting murals there was no doubt in my mind that I wanted to do it in Pacoima because that’s where it needed it. 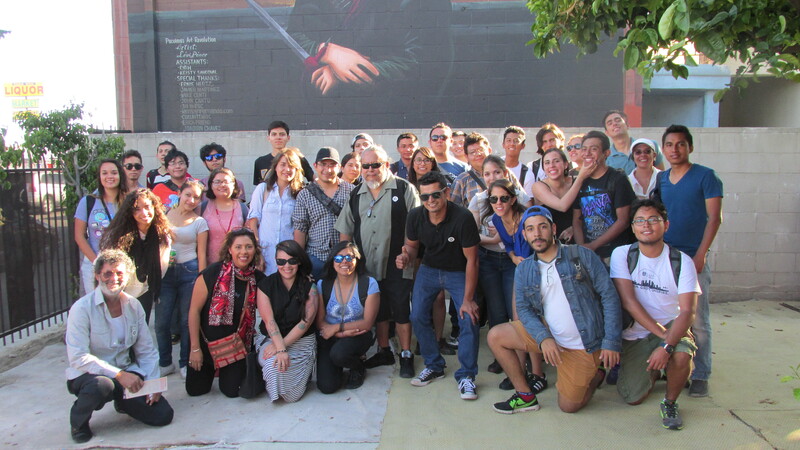 AM: Tell me about your first mural in Pacoima. LP: The first one I did was Danny Trejo – it was December 3rd, 2011. 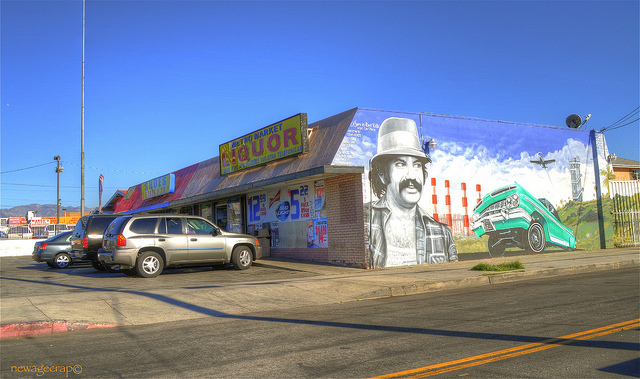 It’s not the first mural I ever did. 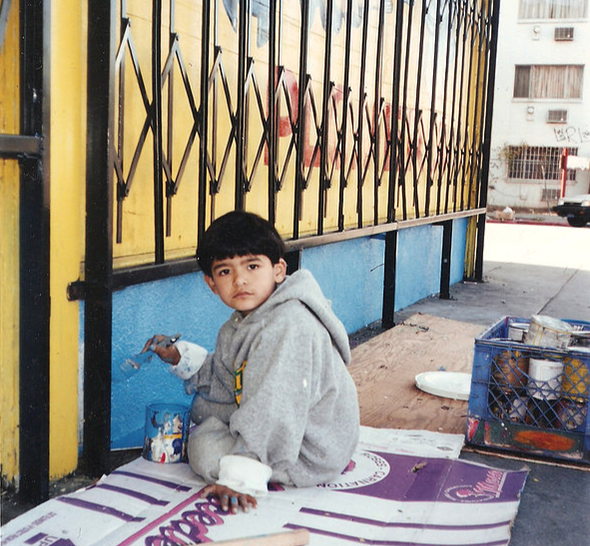 I’ve been painting murals since I was in diapers, with my father. I painted murals at my high school. I’ve always painted, but that’s the first mural I did with the intent of making a change in my community. 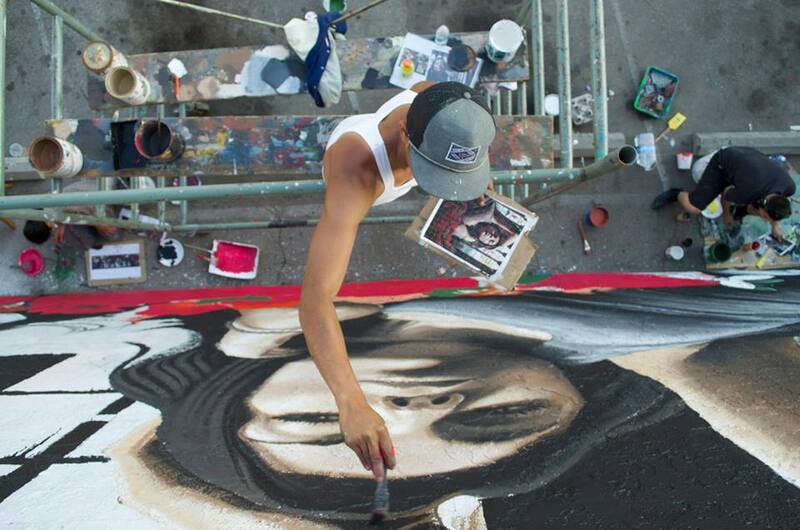 AM: What was the reaction from the community to the first murals that you painted? LP: People loved them. 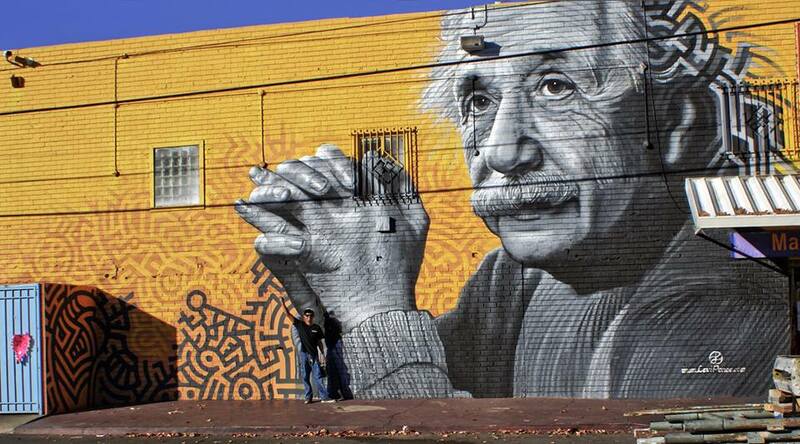 Most people have seen murals but they didn’t have them in their own backyard. Coming with an arts degree and arts background I was really, I feel, elevating the standard of muralism in the area and elevating the way it was done. Before that there were other muralists in the area but they were all getting paid. I wasn’t, and I was using whatever resources I could find to get art up on the walls and gift my work. And that kind of changed the other artists’ mentality and we started seeing other artists in the area do the same, where they were gathering paint and starting to paint for free for the community. AM: What made you want to give to your community rather than charge for your services? LP: I got that from my father. My father’s a free spirit, to say the least. My dad’s some kind of a hippie, some kind of a weird artist, he’s crazy. And ever since I was a child, he would always give things away and he would give things away that sometimes our family needed. I got that from him and when this all came about, the thought of charging never really crossed my mind. I’ve made a living as an artist my entire life and I’ve always charged, but this was different. AM: Can you describe some of the other murals that you have in the area? LP: I try and keep it eclectic but I always paint people – I’m a portrait artist. I try and paint Latino people, but I paint everybody. Overall my work is very positive and very people-centric and I try and improve the neighborhood that I’m painting, whether it’s just aesthetics or with a message or whatever it might be. 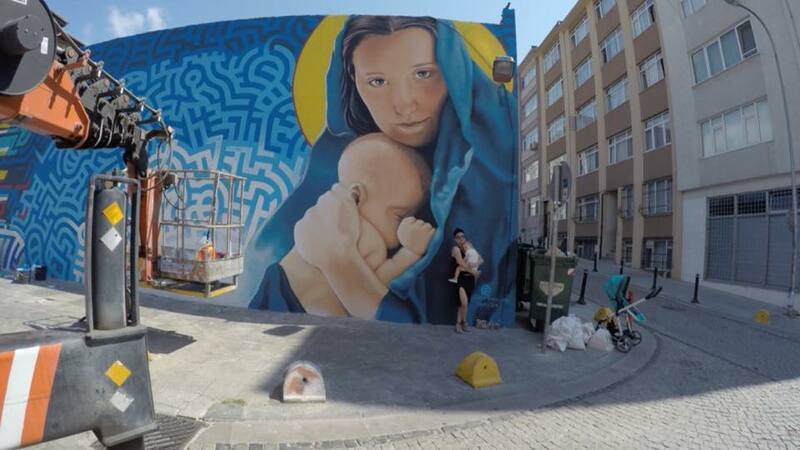 AM: How have your murals helped other people? LP: Most people who come out have some kind of interest in art – that’s what brings them out. But I would say that change happens on different levels. We’re changing a wall and changing the aesthetic, but we’re also changing the mentality of people who help or who are surrounding the mural. We’re showing them not only how they could take control of the neighborhood, but how to take control of their lives. And yeah, there’s people who are working their way out of the projects by art and who are now going to college. And there’s people who simply want to improve and get better at art. AM: How do you make such large works of art? What’s behind it technically? LP: I first draft something up in Photoshop and once I have that layout going I go to the wall and I transfer it. There’s very little improv on the wall, there’s very little guesswork – it’s usually all been hatched out ahead of time. That way I know what kind of colors I’ll need, how much of which color I will need, and then I can divvy up the wall knowing ahead of time what I’m painting. Usually I purchase the supplies, I show up on the wall, and I divide the work among the volunteers. I use the grid system, which has been around since Da Vinci. We just take it one square at a time on the grid. And I divide the grid accordingly, depending on skill level – paint novices and professionals and children and what-not. AM: You’re using regular housepaint and brushes for your tools? LP: I try to use high-quality artist acrylics, but they’re not always available, since most of the stuff I’m paying for – there’s not always a sponsor. You end up just mixing it all together. AM: And you don’t use spray-paint. Could you explain why? LP: First of all I don’t need to, and I get much more control and better results with a brush. People tend to see it as more of an art form when you’re using acrylic and brushes whereas when you’re using cans it takes on a more temporary feeling and has an implication of vandalism that most people still haven’t shaken from their heads. So I try and not use cans, and stick to the brushes. 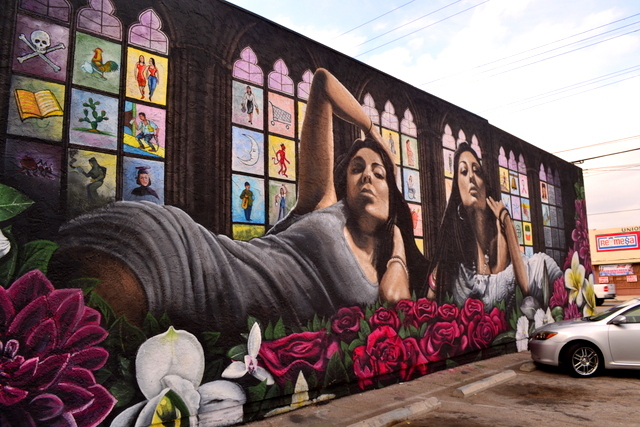 AM: At one point there was a ban on having murals on private property. Can you tell me about that? LP: It was legal up until 2001 and then it became illegal. 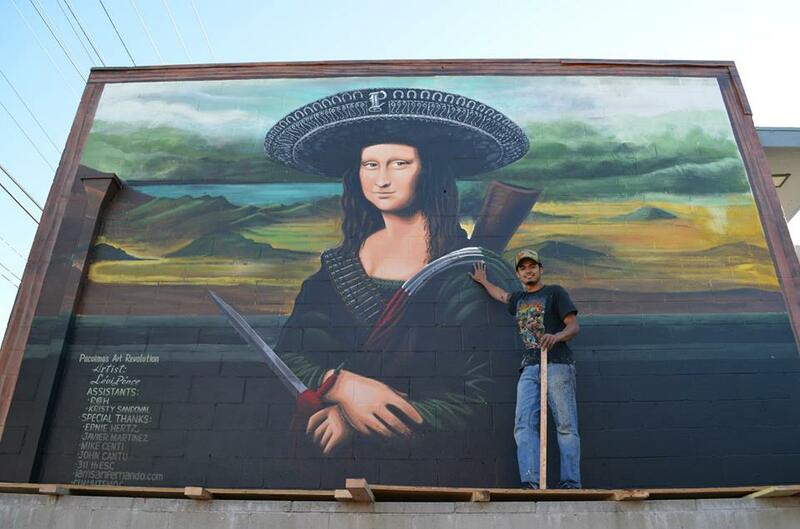 It became illegal because ad agencies had taken advantage of murals and muralists setting up large-scale advertisements and calling it art. So the city caught on, they banned all large-scale artwork. For about 12 years you couldn’t paint outdoors large-scale at all. My work was embraced. It was loved and cherished by the same people who made it illegal. Everybody on the L.A. City Council who voted to make it illegal, I have awards from all of them. Every district up to the mayor, and including state and federal level. I’ve gotten awards all the way up. It’s funny, but the law is flexible, I have found. AM: You had a commission to do a mural at Venice Beach. Can you tell me a bit about that? LP: It was a commissioned piece by the Paradise Project – wonderful people. They believe that we’re all one, we’re all connected, we’re all one divine being. They promote love, they promote being happy on this earth. They wanted to promote pantheism by sharing other people who fell in line with the pantheist thought – whether they were aware of it or not. Most of them were great thinkers or philosophers or scientists. They wanted a good portrait artist – that’s how I came about. And we made it happen at Venice Beach. AM: Where else have you painted murals? 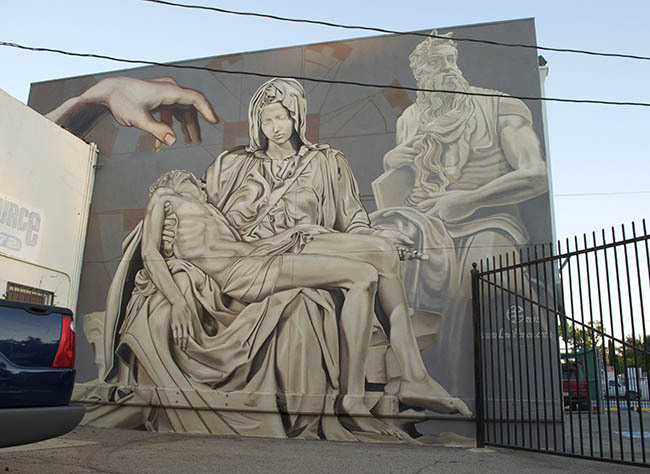 LP: I have them mostly in the San Fernando Valley, a part of Los Angeles that I feel has been neglected art-wise. I’ve been all over – commissioned pieces and museums and festivals. I’ve been to Turkey, in Istanbul, Katikoy. I’ve been at the Museum of Contemporary Art in the Yucatan – MACAY. I’ve painted commercially in the Hamptons, Tribeca, Chelsea. I’ve been in San Francisco, San Diego, and Florida a number of times. I’ve been everywhere. Wherever the brush takes me. AM: What did you study at university? LP: I went to school for animation and I worked in motion graphics for a while and I did animation work for years after graduating. I didn’t paint my first mural until I was 24, so for a couple of years that’s what I did and I still do it to this day. An animation degree took me into motion graphics, which took me into compositing and visual effects for the film industry here in L.A.
I’ve worked on a number of films. I did digital compositing on Star Wars: The Force Awakens – the last Star Wars movie. 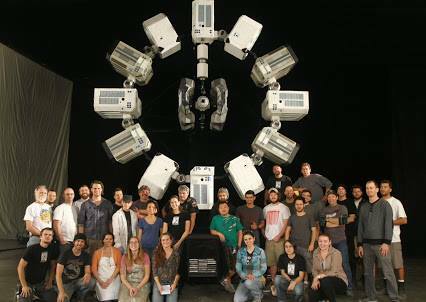 I did practical VFX work on Interstellar, which won an Oscar for visual effects. It was amazing to work on that film – it was an Academy Award winning team. I’ve worked in the film industry and that kind of led me to my work at Disney Imagineering, where I’m combining animation skills, digital skills, practical skills and everything else to help create and design coming attractions. AM: What are your upcoming mural projects? LP: When I first got started I did a 12-piece series. I plan on doing another 12-piece series in Pacoima. I’m taking a break. I’m not going to take on any new big pieces, significant pieces. I’m going to wait about a year or two and actually develop a 12-piece set. And once I have this set of murals I’ll take some time off from Disney Imagineering – a couple of months – and I’ll paint all 12 at the same time. I don’t plan on taking volunteers on these pieces. I’ve always done that and I will continue to do that, but these 12 pieces will be mine. I want to really push what I can do on my own and I believe that by having the art being the best it can be, it will inspire artists in the area to pursue their dreams. A lot of people say you can’t make it as an artist and it’s hard to make a living. And that’s a lie – you can. I see it at Disney all the time, I see it at all the other major studios in L.A. There are so many ways to make a living as an artist. It’s just that most artists aren’t aware of them. They think that art is paint on a canvas. They think of design and drawings in a notebook, and while that’s very true, those same skills can be applied to a variety of different jobs across the board in the entertainment industry – high-paying jobs – and you just need to be aware of them so you can train for them and apply for them. And that’s part of what I’m preaching – part of what I tell people when they come out and paint. For more information about Levi Ponce and his art, please visit leviponce.com. 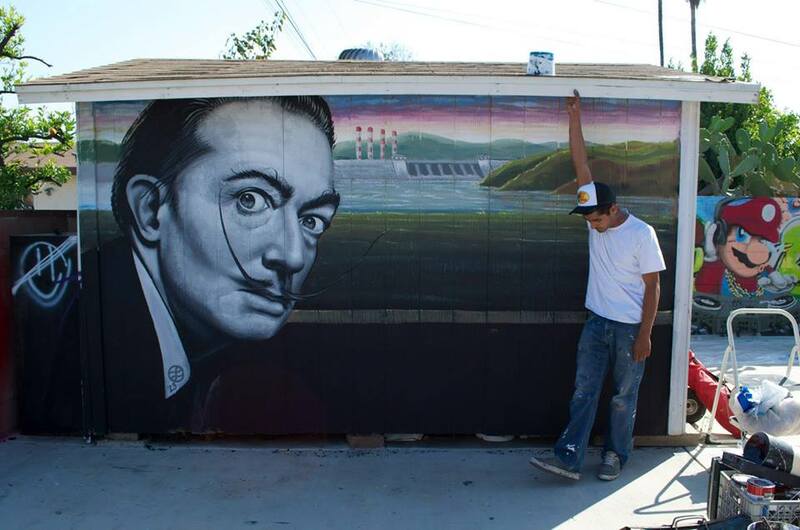 This entry was posted in ART and tagged Buddy Holly mural, Dali mural, Danny Trejo mural, Dia de Pacoima, Einstein mural, Eric Garcetti, Girl with the Hoop Earring, Hector Ponce, Interstellar, interview with Levi Ponce, Kent Twitchell, Kristy Sandoval, Levi Ponce, Los Angeles art, Los Angeles mural, Luminaries of Pantheism, MACAY, Muhammad Ali mural, mural mile, Pacoima, Pacoima art, Pacoima Neighborhood Mural, Paradise project, Peter Shire, Pieta mural, Ramona Lisa, Resida art, San Fernando art, San Fernando mural, The day the music died, Tribute to Michelangelo. Bookmark the permalink. Awesome and moving interview, Anita. I hope lots of people read this and feel inspired to do something creative and new. 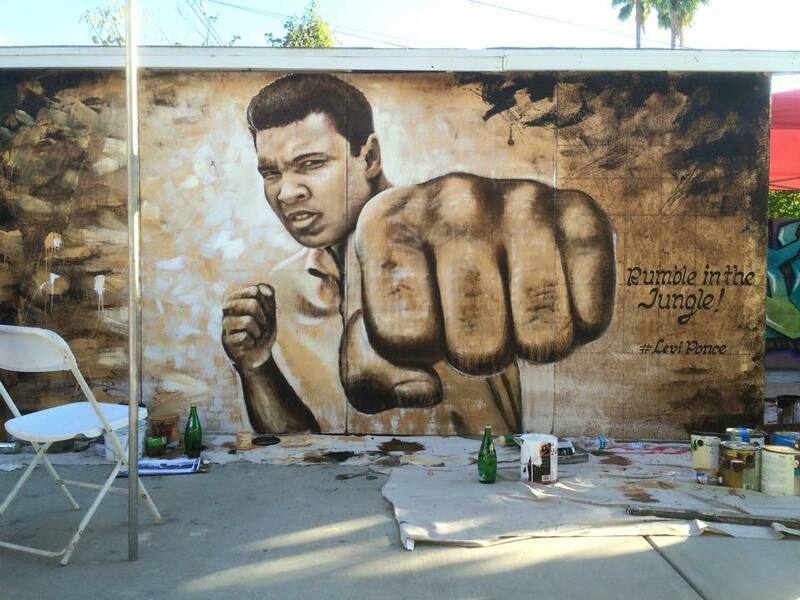 This makes me want to do the “Mural Mile” next time I’m in Socal. Thanks a lot, Kim. I agree that what Levi has done and is doing is very inspiring.